Susan Anderson and I joined the Shasta Mayflies on their trip to the Rogue River out of Shady Cove for steelhead and the Holy Waters for trout. It was perfect fall weather, sunny but the breeze had a little bite to it and the trees were all changing colors. It was gorgeous and the fishing wasn't bad either. 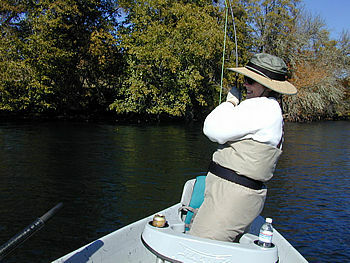 Rachel Andras of Flywater Travel (we all remember her as Rachel from The Fly Shop in Redding) booked our guides for us. Rachel has set me up for all of my guides, etc. for my trip to Argentina and with Scott Howell for the North Umpqua in Sept 2006. Don't forget her when you want to book a trip or a guide. 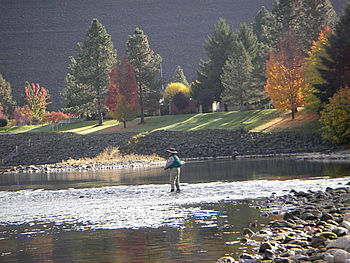 On Friday, Susan and I flew from San Francisco to Medford, rented a car, checked into our motel, changed into fishing gear, and our guide picked us up at noon. About 15 minutes after putting in, I hooked a huge steelhead which we almost had in the net three times before it broke off. Our best guess is 28 - 30" buck. I caught big steelhead last year and I caught this one this year - so there are big ones in the Rogue. Dave Teitzel, our guide for Friday, was fantastic. He had us using 3 weighted flies with a water balloon indicator. I have used this technique before on the Green, but it was just the balloon. Dave put a little water in the balloon which made it even more effective. I highly recommend balloons for indicators. They last all day, cast great, don't get soggy in the water, and are very festive. As of Saturday, Susan is no longer a steelhead virgin. She landed 3 plus a small rainbow. 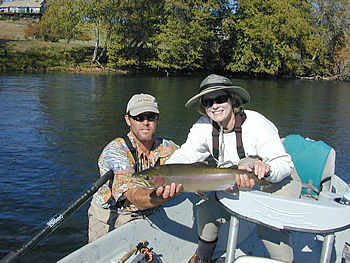 According to the Steve Eadie, our guide extraordinaire, the fish are rainbows until they are 18" then they are steelhead. So, on the Rogue, all rainbows are under 18" and all steelhead are over 18". I caught a couple plus the smallest fish that Steve has ever seen caught, but I'm taking credit for it. He's biased because he is used to fishing for big game fish. If you ever go into Bob Marriott's Fly Shop in Fullerton, CA there is a huge blue marlin over the travel desk. Steve caught it and donated it when worked there. Actually, he got tired of moving it from place to place. The Fishin Hole fly shop and both of our guides had recommended various flies for the Holy Waters but the one fly everyone said to fish was a small bead head white crystal bugger. After using water loads to cast 3 weighted flies for steelhead, I was lazy, dropped my back cast and caught weeds behind me. Instead of walking back and untangling my fly, I snapped it and it plopped in the water in front of me. It worked like a charm. As I was retrieving my fly, a fish swam by and grabbed it. Recently, I ordered a lot of back issues of The Inside Angler from Christine Fong. I picked out issues that had articles of places that I had fished or wanted to fish. Christine cautioned me that some of the information might be out of date, but I found the fishing information doesn't change that much. Mike Fong wrote about fishing the Holy Waters in January 1995. Mike had recommended blue wing olives so I tied on one of those. It was getting cold, standing in the water in the shade, so I cautiously maneuvered over the slimy rocks holding my rod out to the side so it wouldn't get broken if I fell. The rod jerked and I had another fish on. The third fish, I actually cast to and caught (blue wing olive).